Madala and Ndlovu were supervised by Professor Alain Assounga of the School of Clinical Medicine at UKZN. ‘I am ecstatic!’ said Madala, who is Head of Internal Medicine at Sefako Makgatho University (SMU) in Pretoria. ‘I plan to help develop researchers as well as students in my department to add to research output and academic scholarship. She says limited funding for clinical research – which is extremely expensive – had been a problem during her studies. She applied for and received various grants but they had not been sufficient so parts of the research were deferred to post-doctoral research studies. Her study evaluated risk factors, complications and diagnostic methods of chronic kidney disease. Findings were used to develop a prediction equation to detect kidney disease in Africans which was shown to be more accurate than existing equations and will be developed further in a larger sample population. The study also provided greater understanding into aspects of chronic kidney disease epidemiology to influence healthcare practice. 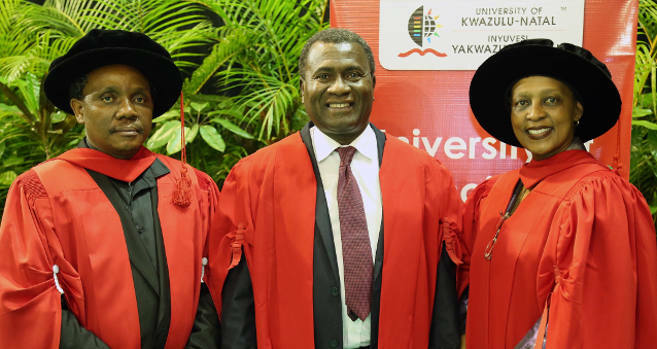 Madala completed her MBChB and Master of Medicine (MMed) studies at the former University of Natal, where she also obtained the Fellowship of the College of Physicians (South Africa) qualifying as a Specialist Physician in 1996 and registering as a nephrologist in 1999. After the creation of UKZN, she stayed on as a lecturer and Principal Specialist Nephrologist in the Department of Medicine and Department of Nephrology until December 2015 when she left to take up her current position at SMU. The bubbly Madala likes experimenting with new food recipes and enjoys reading, live theatre, birding and wildlife. Ndlovu’s PhD research investigated the effects of HIV seropositive status on the outcomes of end-stage renal failure patients on peritoneal dialysis. Although this work was not a novel study, it was the first prospective study of its kind to be conducted with a reasonable sample size. According to the findings, increased risks of complications such as infections can complicate the treatment of HIV positive patients on peritoneal dialysis. Overall outcomes indicated that this form of dialysis is a viable alternative for HIV-positive end-stage renal failure. Ndlovu did his undergraduate Medical training at the University of Cape Town and his postgraduate work at UKZN. ‘I have three sons and a daughter. I cherish my family time and love watching sport, especially soccer,’ he said.